I was fifteen the first time I went to the Newport Jazz Festival. I was so amazed by the music, I vowed that by age thirty I needed to play there. Now, at age eighteen, I am grateful to say that my wish came true thanks to Natixis Global Asset Management and MMEA. 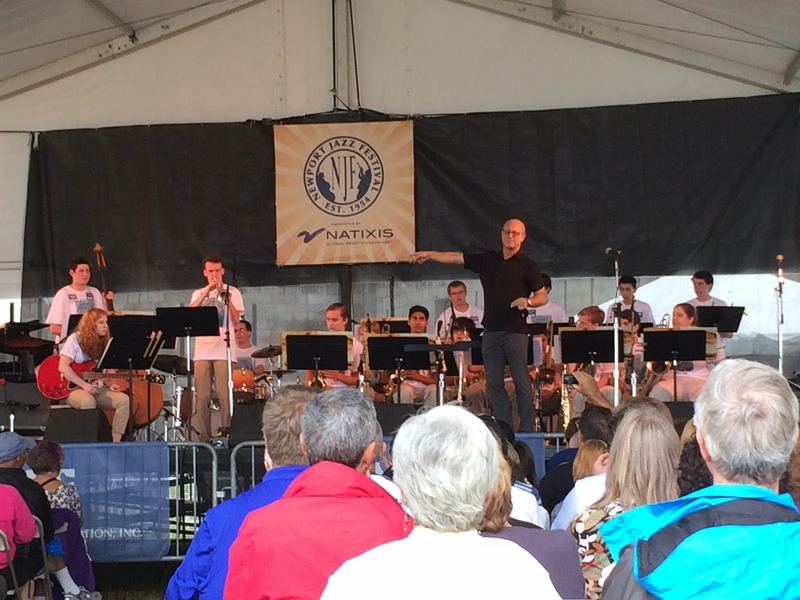 On Sunday, August 3rd at 11 a.m. the MA All State Jazz Band played at the festival under the direction of conductor Shelly Berg. Our conductor, Shelly Berg, steps into a room and immediatly captures everyone's attention because of his sheer enthusiasm for life. While under his direction, I found myself not only focusing more on the music, but I felt the music more. Shelly would tell us stories and infuse his own into the music to give us a goal to reach for. And with his leadership we not only sounded better, but we were all smiling and genuinely happy. Shelly taught us that good music takes hard work- but it's completely worth it. To learn more about Shelly, go to his website. Recently I was fortunate enough to interview Shelly about his experiences at the festival, as well as his philosophies on teaching and performing. 1. Describe your experience conducting the MA All State jazz band at the Newport Jazz Festival. Were there any moments that really stood out to you? The most exciting thing about the Newport concert was the connection the group made with the audience. It is important for young musicians to feel a wildly enthusiastic response, as this is what makes all of the effort and determination worthwhile. 2. What is it like working with younger musicians? Do you find that you approach teaching younger musicians differently than teaching college musicians? I love working with younger musicians. I consider it an honor to instill ideas about music making, and the unique role and power of music in the world. These concepts are the same whether working with beginners or professionals. Obviously, I spend more time on fundamental concepts with young musicians. Fundamentals are the “fuel” for expression, so I am happy to help provide those insights as well. 3. With such a limited amount of rehearsal time, how do you maximize the progress in each rehearsal? When rehearsal time is limited I take an approach which begins with the “abstract”, and then moves as far towards the “exact” as possible. In other words, it is important for the musicians to understand the context and inspiration of each piece. Once they have “fallen in love” with the music, they have the tools and motivation to drill down through the detail. If I start with the detail and focus primarily on that, we could end up with a concert that is more technically “perfect” but far less inspiring and relevant to the audience. 4. How do you go about choosing pieces for a group to play? Who are some of your main influences for composition? I choose repertoire with a few things in mind. First of all, the arc of the concert should be a journey, so the pieces should reflect a variety of contexts. I want the music to have depth and purpose, and I want it to be fun for the players. In an all state situation, I want there to be teachable moments in what it takes to master music from the various styles I select. I have more compositional influences than I can name. In big band music alone, I have been influenced by many, many great writers and arrangers. Robert Farnon influenced Johnny Mandel, Nelson Riddle and so many orchestrators. Duke Ellington influenced everybody. Thad Jones has left his mark on all of the writers of the last 40 years. The music of Maria Schneider and Bob Brookmeyer are transformational. Vince Mendoza, John Clayton and so many others are continuing to compose and arrange some of the greatest music ever. The more I go on, the more I will leave some out who should be included in this list. 5. Do you approach performing, composing, and teaching all from different angles or do you find the same philosophies carry over and influence the others? Performing, composing, and teaching are all reflections of the same ideals. We practice to fill our “technical wells” with proficiencies. Along the way, we need to understand the power and context that the things we know convey. We perform, compose, and teach through our “spiritual wells”, so that our music can be honest and transparent, conveying universal emotions and values. 6. In your opinion, what is the most important thing to teach people about jazz music? The most important thing to teach is that music is endless, so there are no shortcuts. Music is a spiritual journey, and everything we practice and learn helps us remove barriers to pure expression. See #6! I believe that a talented and dedicated musician can have a career. Each of us must find, cultivate, nurture and maintain our own audience. If our music is resonant to our audience, that audience will grow, support us, and stay with us throughout our careers. I am so grateful that the world of jazz has allowed me to meet so many kind, warmhearted people. I certainly had the experience of my life at Newport, and this moment inspires me to continue to put in hard work to make good music.